Since 2007, the WWF’s Earth Hour is a global initiative inviting everyone to switch off lights for one hour as a symbol of responsibility for our home planet. We joined it, also because it is a precious opportunity to talk about light pollution, the #1 enemy of our precious starry skies. “Starting as a symbolic lights out event in Sydney in 2007, Earth Hour is now the world’s largest grassroots movement for the environment, inspiring millions of people to take action for our planet and nature”. This is what the WWF people say about their Earth Hour initiative. Of course, rising awareness about the effects of our actions on the natural environment is extremely important to preserve the night sky against light pollution. At Virtual Telescope we work tirelessly to educate people to the importance of starry skies and environment preservation. Even from our cities we can see quite a number of stars, if we use artificial light in an intelligent way. 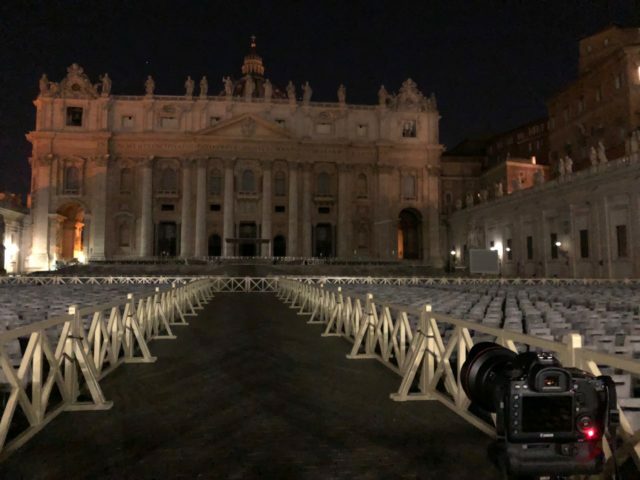 Supporting an initiative as Earth Hour is therefore part of our mission and with me living in Rome I decided to reach St. Peter’s Basilica, which lights were going to be switched off to join the international celebration. Having legendary monuments like this sharing the goal of Earth Hour is very “powerful”, I believe. I arrived there when the lights were already turned off. I must admit that seeing the Basilica and the entire colonnades in the darkness was an emotion by itself. I never had this sight before. Quite luckily, the square was opened and I could approach the Basilica, leaving behind me a few streetlamps of the square and facing the building with no artificial lights on the foreground. I was there with my light tripod and with my usual Canon 5DmIV DSLR body. I chose my widest rectilinear lens, the precious Canon EF 11-24mm f/4 L USM, used at 11mm@f/4. Above is one of the images I collected, the one I believe can bring to you my experience there. 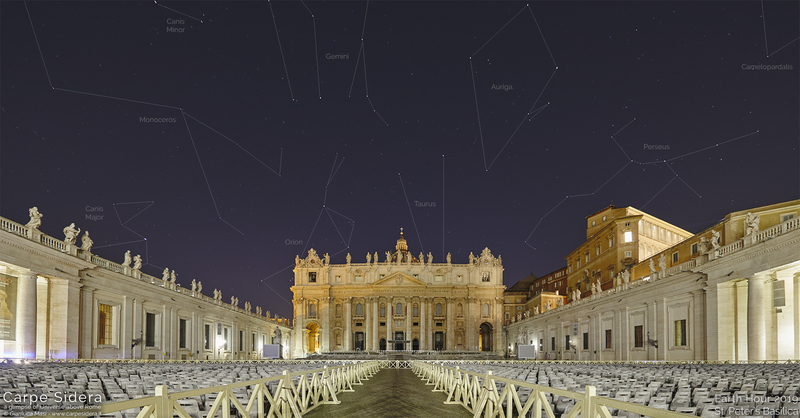 As I do sometimes, I managed to connect the stars with gentle lines, to mark the constellations above St. Peter’s Dome and Basilica. The sky is still up there: keep it alive! Below is a short video I did there. I hope these initiatives will help the community understanding how responsible we are to preserve this unique planet. No other than us need to take action on this. We will always support them and will work to promote the importance of the sky as a natural element and how easy it is to keep it well visible even from our cities, provided we use our intelligence in the right way.